Read an Excerpt from "Sea Glass"
Read FBC Review of "Storm Glass"
INTRODUCTION: When the Glass series featuring Opal Cowan who is a secondary character in the Study novels was announced, I was both excited and apprehensive. Will Opal's voice be as fresh, but also different from Yelena's? Will the series manage to keep my interest in the Sitia/Ixia universe? As I stated in my review of Storm Glass linked above, Ms. Snyder delivered and in Sea Glass the second installment of this sequence, she kept delivering her trademark fast paced adventure novel with magic and romance that you do not want to put down once you get into. And this time I planned my reading in a longer chunk of free time so I finished "Sea Glass" in one sitting and I would have liked to read more. OVERVIEW: Sea Glass follows the events of Storm Glass, picking up where that ended. Sea Glass completes the open threads from Storm Glass and together the two books could be seen as one huge novel, though a new adventure for Opal is scheduled for Fall 2011 as we find out at the end of the novel, while in the meantime Ms. Snyder is going to publish some books in a new universe series. For a general setting overview I suggest checking out the Storm Glass review above, which contains a short overview of the Study series too. Here I will just mention that Sea Glass is narrated by Opal, and features Janco, Kade, Devlen, Ulrick and Leif as main characters, though of course all the other main Sitian characters appear, most notably Zitora, Yelena and Mara, and several new one ones are introduced. The novel stands at almost 380 pages and takes place in Sitia, though as in the previous installment we sample the vastness of the country and its clan regions. ANALYSIS: Why would you read Sea Glass and more generally any of Maria Snyder's Sitia/Ixia novels from the Study series to the current Glass sequence? For me there are two main reasons: voice and content and I will discuss them next. 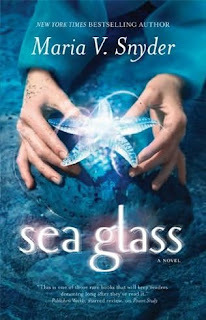 As content goes, if you want a fast and exciting read Sea Glass is for you since as usual Ms. Snyder delivers a very entertaining yarn with adventures, plots, counter-plots, switched bodies, magic, romance, fights, hair-rising escapes; all the hallmarks of the author's work are in evidence here. Modern in sensibilities, while hearkening back to the classical "adventure romances" of the past in story, Sea Glass is an addictive read. Opal's voice is even more distinctive here than in her debut as narrator since she starts to refuse being pushed around by various powers to be, from the Council, to her "mentors" and even all the assorted parties that want her unique glass skill for their mostly self-interested purposes. In Storm Glass, Opal was an apprentice with some past fame, but no current major achievements, laboring under the taunt of her "one-trick" nickname, until her special powers burst unexpectedly and frightened quite a few people. If Yelena as a "soul finder" was somewhat scary for the Sitians, she was part of their lore, but Opal's ability to capture magic in glass and drain a magician of his or her powers, in the process was new and frightening even for people who otherwise liked her, while of course the various plotters had their own ideas how to use her. I also liked a lot the interactions between characters, though in Sea Glass Janco and Devlen's relations with Opal were more interesting than her boyfriend Kade and her former boyfriend Ulrick. Kade was more alluring when dark and mysterious, while Ulrick's transformation made him a bit too much of a one dimensional character, but Devlen, one of the major villains of Storm Glass, becomes much more nuanced here, while Janco, well is Janco and his scenes are always a delight. Another character that puzzled me a bit was Zitora and though we see her take on the things at some point, I still thought she was a bit out of character in her rejection of Opal. Another character that shines in Sea Glass is Leif who completes his transformation from grumpy almost villain in Magic Study to main series hero here and he provides the best family support for Opal - well almost family, him being Mara's fiancee. If there is one major complaint I have is that we have to wait two years for more adventures of Opal and co, though I will check out anything that Ms. Snyder puts out in the meantime. Edit later: it seems the two years is a typo in the book and we have to wait only one year for Spy Glass - ie Fall 2010; Yeees!!! Two years? :( Glad you liked the book, I just found Snyder after meaning to read it for so long. I really enjoy her writing! I can see the excitement in your voice. I am sadly unfamiliar with any work Snyder has written. Ah, that time and that money. Always plotting against me. :) I am on the lookout chance to secure me copies. Excellent news - added an edit to the review; many thanks for the info!! Glad I could help! Perhaps Maria wasn't aware of the typo at the time she signed your copy?